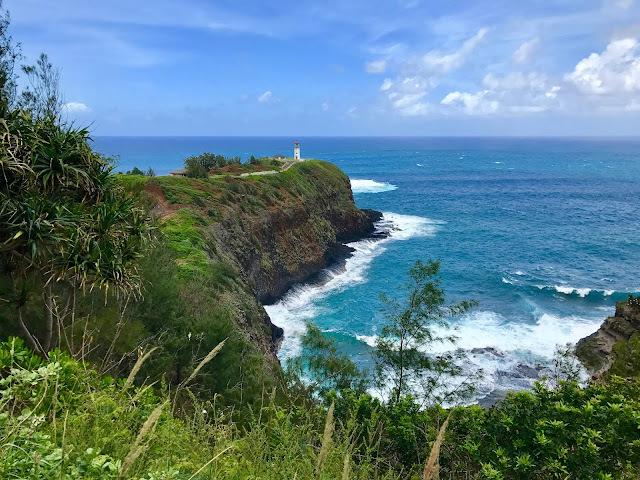 Having grown up in Florida I never had the urge to go to Hawai'i because I already had beautiful beaches, blue water and tropical flowers in my own state. 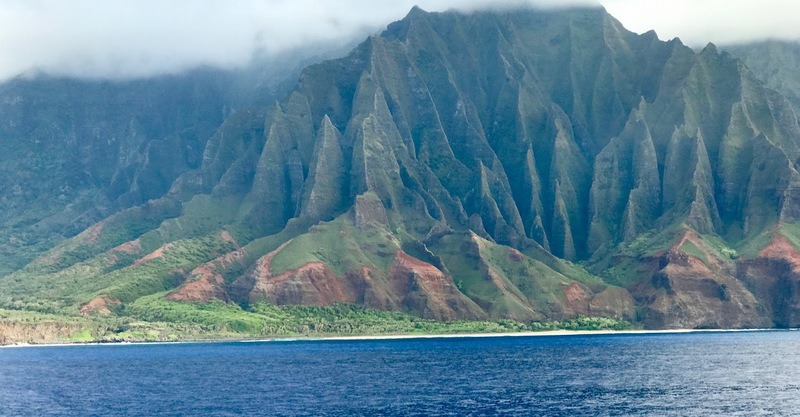 Having just spent two weeks visiting four of the 132-island chain - Kaua'i, Hawaii the big island, Maui and O'ahu - boy, was I wrong. From the attitudes of the residents of this multi-cultural state to its endearing mountains and enticing aromas, Hawai'i should be on everyone's bucket list. Here's a brief synopsis of those four islands. 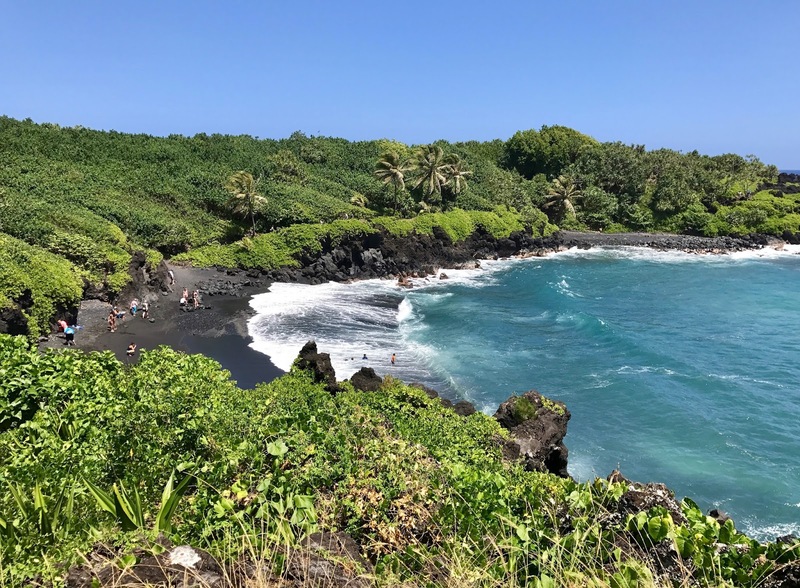 AKilauea National Wildlife Refuge, Kilaue. Photo © Judy Wells. It comes by its sobriquet honestly. 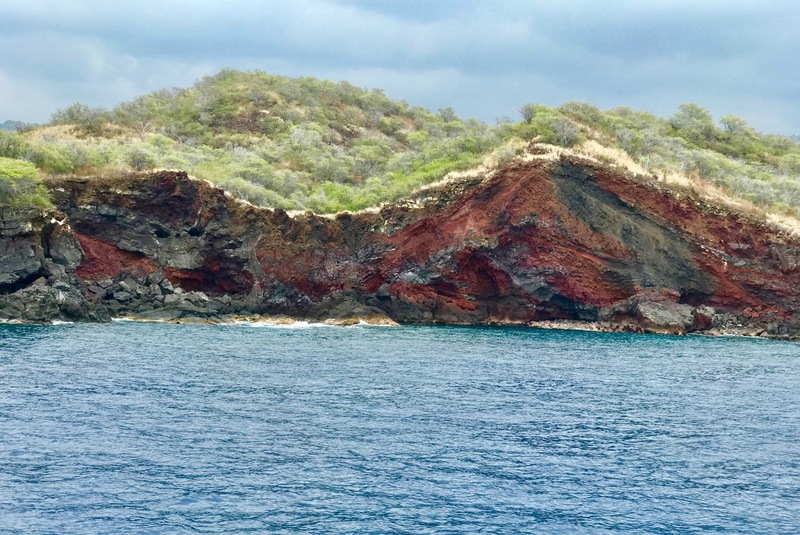 Five million years since its volcano went dormant has given Mother Nature time to cover lava with a flourish. 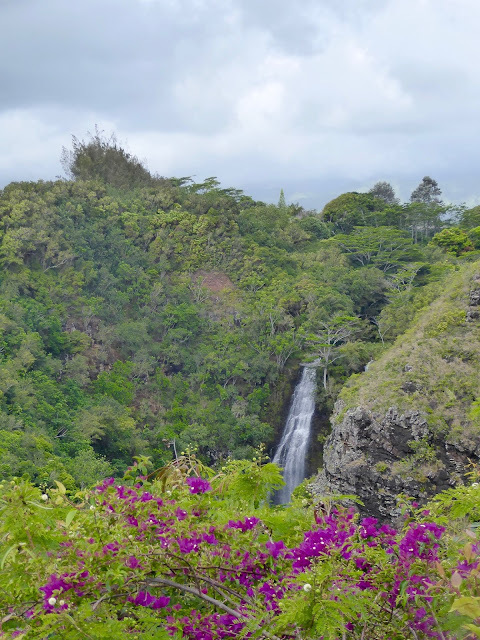 You soon realize why Kaua'i is Hollywood's first choice for scenic jungle. Ever since "South Pacific," when Mitzi Gaynor washed that man out of her hair and Bali Hai called, the film industry has been a frequent visitor. One branch of 'Opaeka'a Falls. Photo© Judy Wells. The lush green slopes of mountains meet the blindingly blue ocean. Slices of golden sand beaches, jagged black rocks and a sliver of two- or one-lane roads separate the two forces. Fruit and flowers abound, the invasive African tulip and and albizia trees stalk the slopes adding fringed canopies over the roads and flame orange blossoms to the multiple shades of green. Stalks of ginger, hibiscus, plumaria blossoms, crotons, Ti plants and ferns add color and aroma. The Alula, was thought to be extinct until a few examples were found among he cliffs on the Napali Coast cliffs. 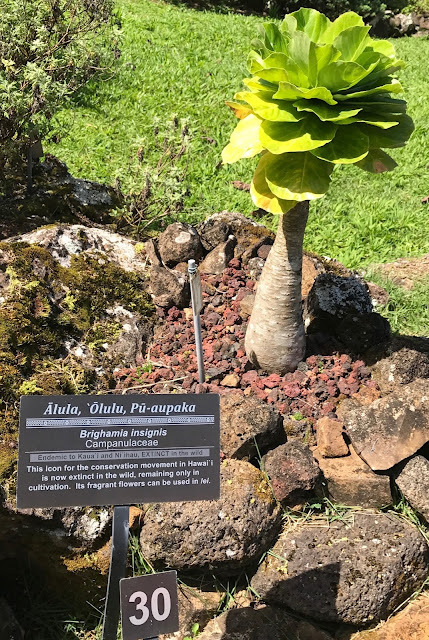 Botanists at Limahuli have propagated it and hope to reintroduce it back on the island some day. 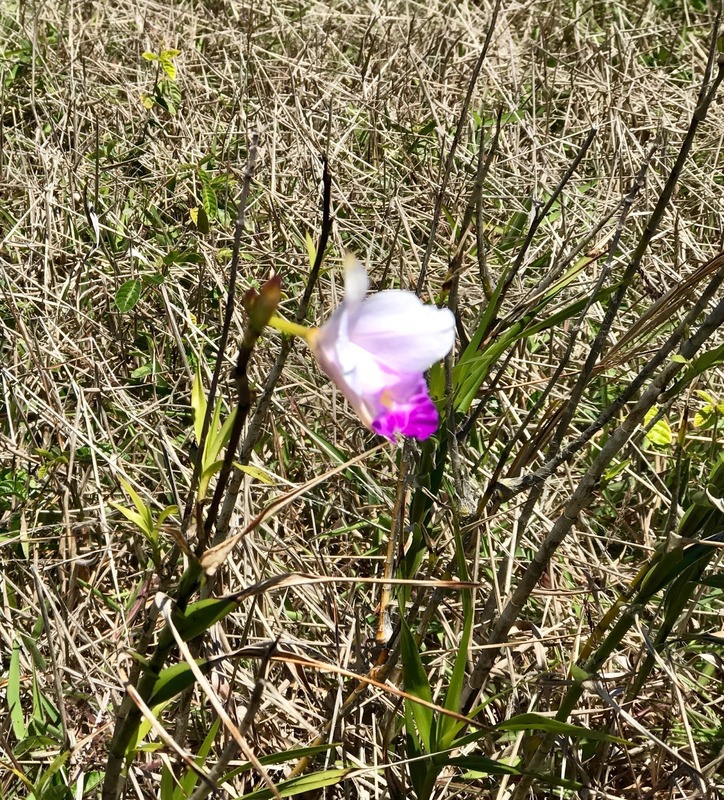 Just one reason the American Horticultural Society named it the best natural botanical garden in the U. S. A. Photo © Judy Wells. 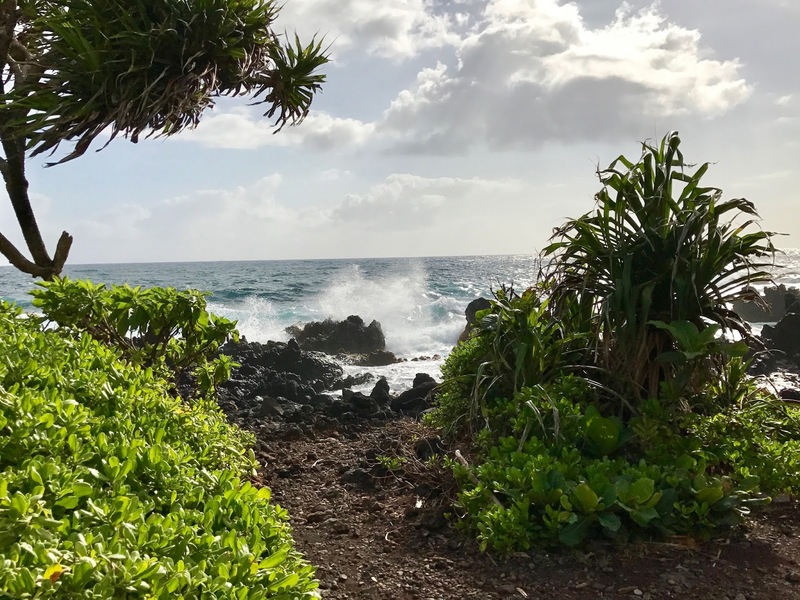 Limahuli Gardens, just short of where the road ends along the north shore, is a must-see for gardeners and anyone curious about the early Hawai'ans or what all of these tropical plants are and how they were used. 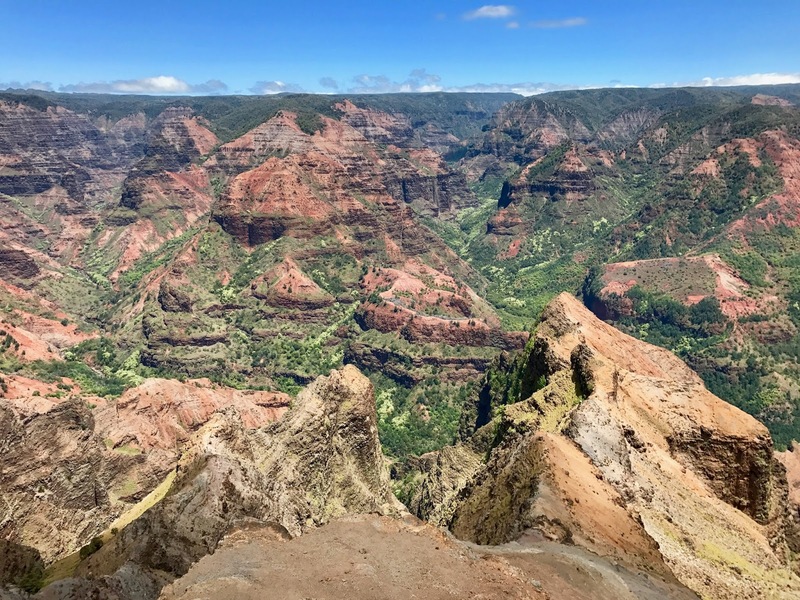 Waimea Canyon. Photo © Judy Wells. Waimea Canyon, Hawai'i's version of the Grand Canyon, cuts through Kaua's midsection, and the island's west side, the Na Pali Coast, is accessible only by helicopter, boat or on foot. 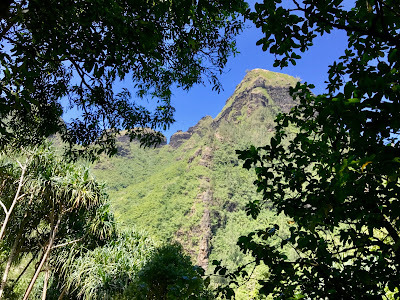 "The Cathedral," Na Pali Coast, Kaua'i. Photo © Judy Wells. Roosters and chickens probably outnumber the human residents on this least developed of the main islands. Jungle fowl. Photo © Judy Wells. 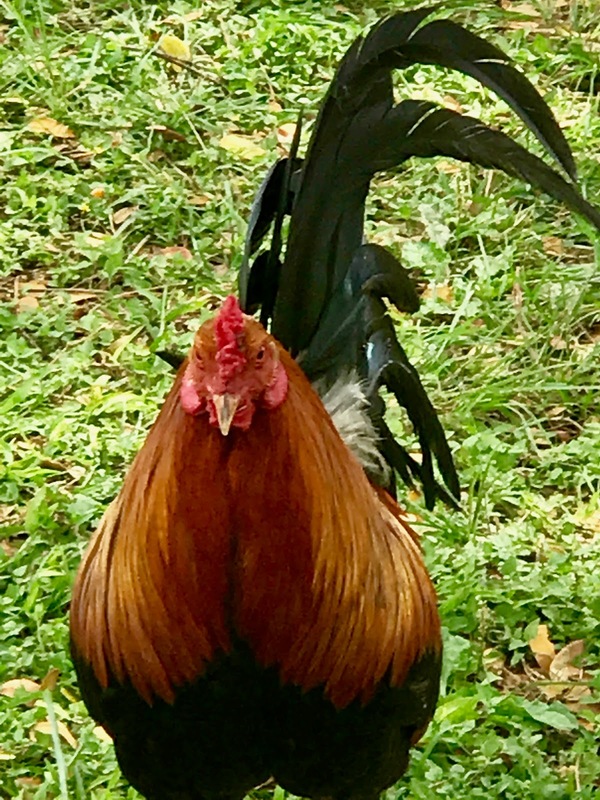 Hana, Maui. Photos © Judy Wells. Two volcanoes whose lava flows overlapped to form one island make for many valleys, thus the nickname. 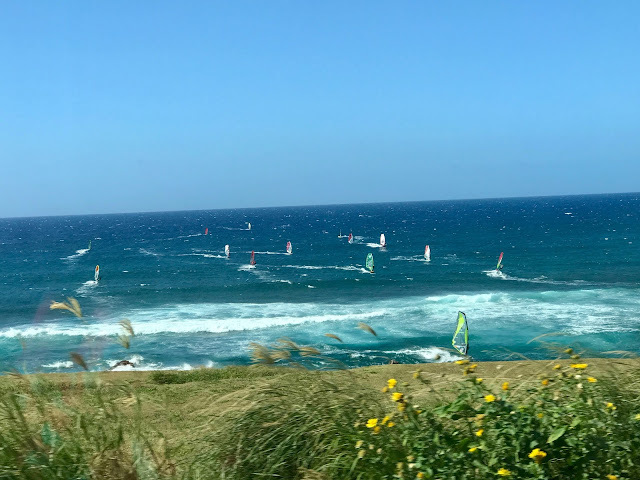 Windsurfers at Kanaha (Kite) Beach Park, Maui. Photo © Judy Wells. Humpback whales love its waters. Surfers love its swells; amateurs at Ho'okipa Beach, the pros at Pe'ahi (Jaws). Wind and kite surfers/boarders love its water and wind at Kanaha (Kite) Beach Park. Astronomers love the lack of light pollution atop Haleakala crater, the younger of the volcanoes. 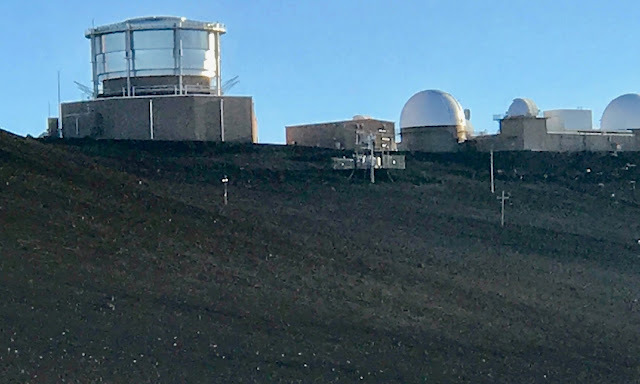 Observatories at Haleakala State Park, Maui. Photo © by Judy Wells. "We don't have carnival rides on Maui," said our guide and driver. "Our number one thrill is Haleakala Highway." 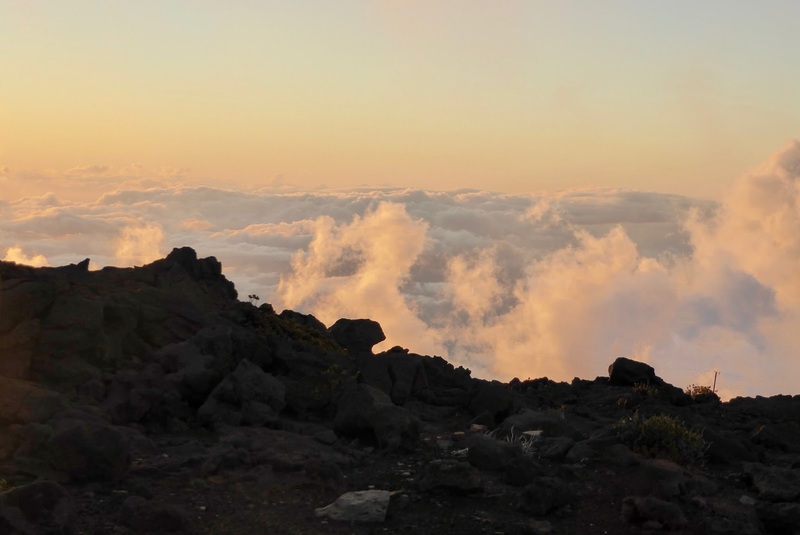 Haleakala rim at sunset. Photo © Judy Wells. 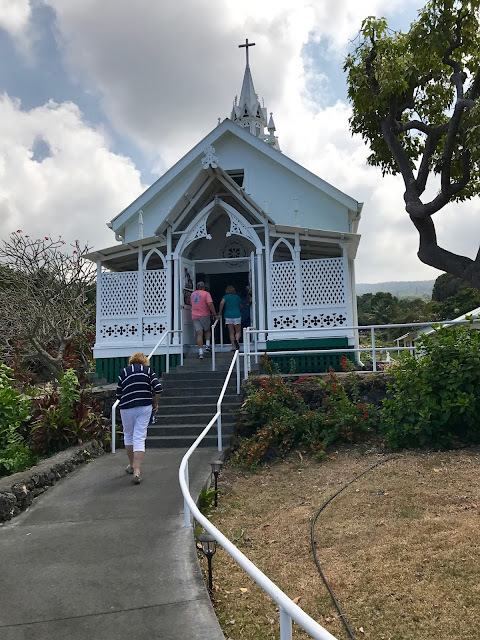 The journey up 10,000 feet to Haleakala National Park is a curvy challenging one with several stops to adjust to altitude. 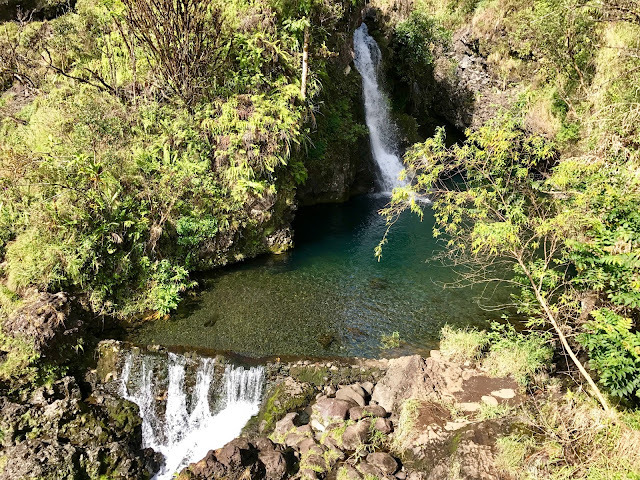 At the top you realize how diverse Maui's climate can be. Sunset, sunrise and moonless nights are the most popular and dramatic times to visit and whenever, you are likely to encounter very cold temperatures, sometimes even snow, and a strong wind that chills to the bone. The observatories are visible but off limits. Black sand beach at Wai'anapanapa State Park, road to Hana, Maui. Photo © Judy Wells. Another challenge to reach is the sleepy burg of Hana. 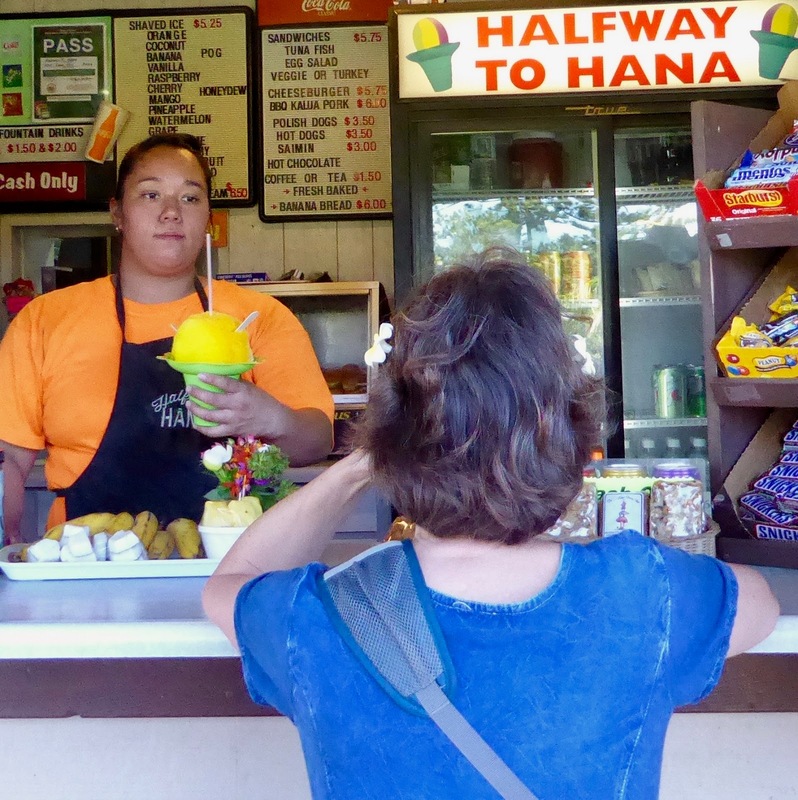 The road to Hana confronts visitors with 56 one-lane bridges, 617 curves, waterfalls, black sand beaches, fern and bamboo forests and a halfway stop for ice cream or shave ice. 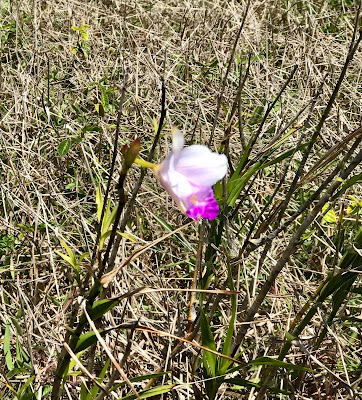 Wild orchids growing from lava fields and its size - larger than the other islands combined - account for its identifiers. Kilauae lava ash field, caldera in the background. Photo © Judy Wells. I started in Hilo, the dry side of the island. 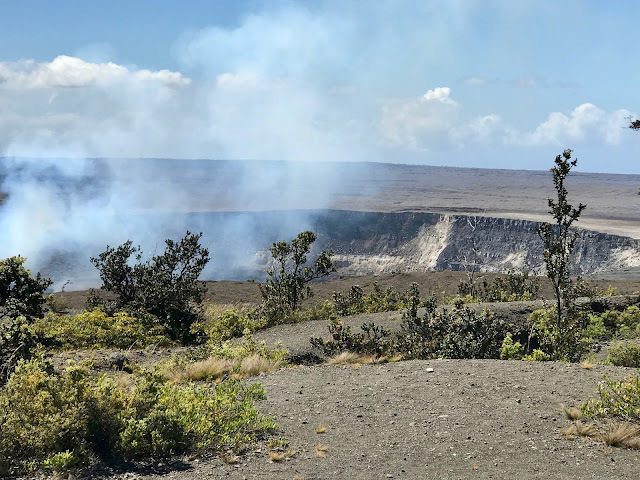 This is where you come to see and experience active volcanoes complete with steaming calderas and lava lakes, boiling steam vents, lava fields and tubes, flowing lava and vog, noxious fumes from lava that can cover the slopes like fog and send visitors to emergency stations. A group walking on the lava ash field seen in photo above. Photo © Judy Wells. And yes, you can get up close to the hot stuff at Volcanoes National Park. Kilauea's crater. Photo © Judy Wells. 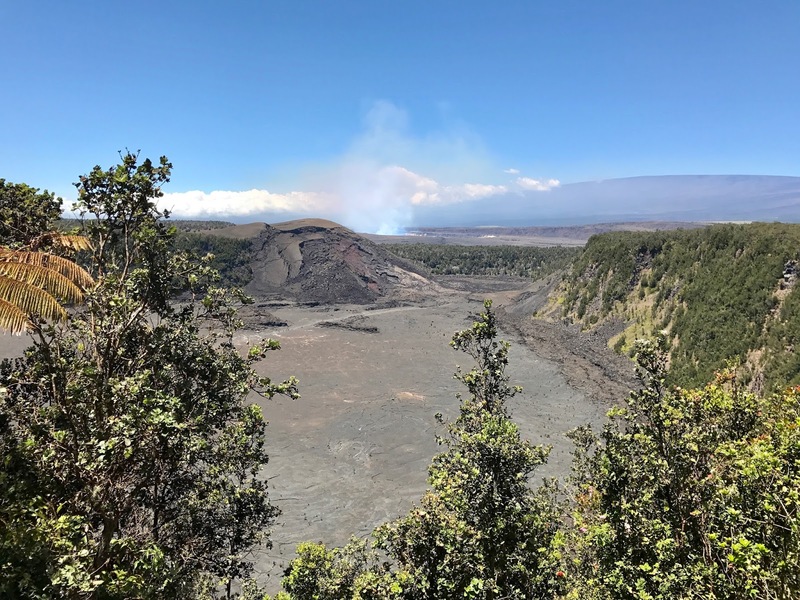 Kilauea, the "spewing" in Hawai'an, is the most active, erupting lava daily since 1983 and adding 36 acres a year to the Big Isle. Moana Kea is the snow mountain and Moana Loa, long mountain, is not only so heavy it has made a dent in the ocean floor, it is overdue to blow, say the natives. Don't be surprised if the Jimmy Buffett song, "Where ya gonna go when the volcano blow," keeps popping into your head. Didn't see any rainbows at Rainbow Falls but it was worth a stop. At 1:04 a.m. 1946, a tsunami from an earthquake in Alaska hit the old town of Hilo, destroying much of it. Since then the town has been rebuilt but farther up the mountain. 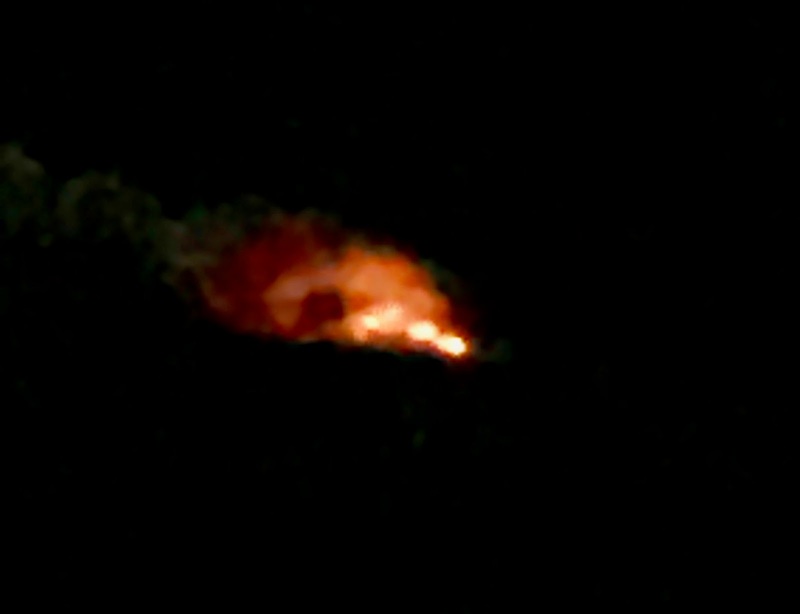 Hawai'i coast at night where live lava spewing from Kilauea can be seen hitting the ocean. Pele, goddess of volcanoes, decided to obscure the mountainside flow with vog, heavy steam, but we did see the explosive meeting of two elements. Kailua Kona is almost directly across the Big Island on the leeward (sunny and dry) side. 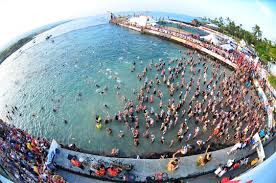 You learn this is the site of the annual Ironman World Championship as soon as you land at the pier because this is where it begins and ends. There is another volcano here, Hualalai. It shakes from time to time but hasn't erupted since 1801. However, it has been on a 200-year cycle. 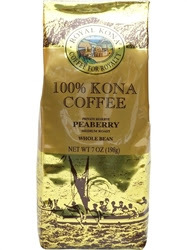 When you reach 800 to 2,000 feet above sea level, you have reached coffee, Kona coffee, territory, grown only here. Prepare to learn about coffee culture and to sample dozens of varieties. Never much of a coffee drinker, I went along but wouldn't you know, actually found one I truly liked, pea bean, at $50 a pound. Think I'll stick to tea. British explorer Capt. James Cook arrived here in 1778, missionaries followed in the 1800s. 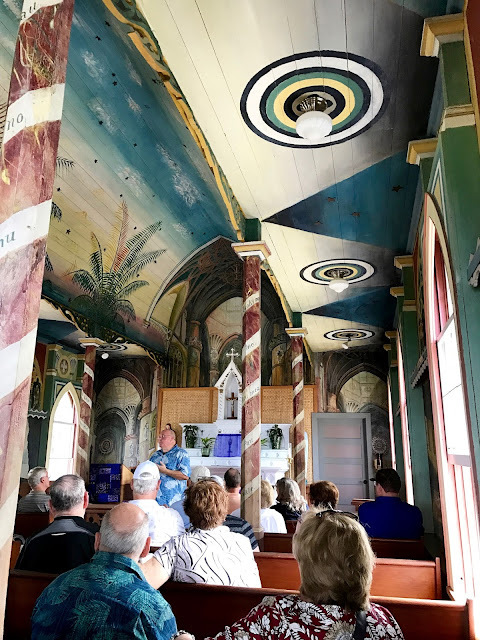 Belgian priest Jean (John) Berchmans Velghe had yet to learn the Hawai'ian language so when he built a church painted its interior to teach the natives through pictures. The result is charming as well as a remarkable piece of work. Officially the St. Benedict Roman Catholic Church, everyone calls it the Painted Church. Two ki'i warn visitors of great manu here. Photo © Judy Wells. 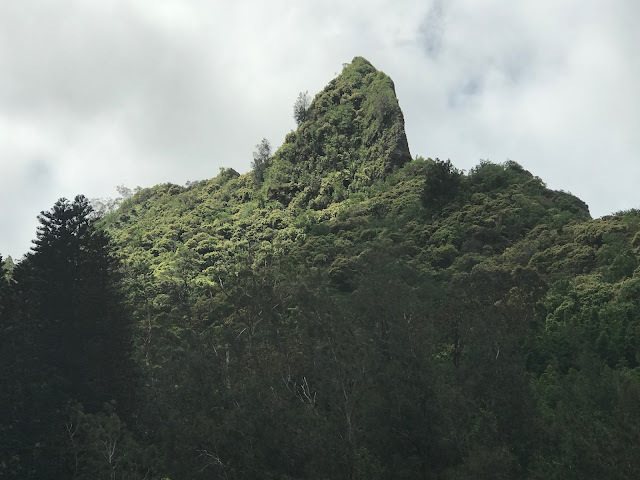 Poohonau o Honaunau National Historic Park is a great spot to learn about pre-Cook Hawai'ian culture. 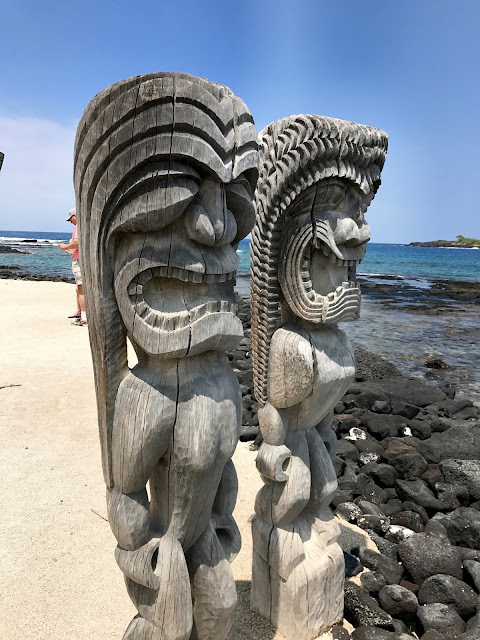 In addition to housing the bones of 23 chiefs, including King Kamehamea's great-grandfather, which gave it manu, great spiritual power, this was pu'uhonua, a place of refuge. Kapu was the spiritual law of the land and death followed for anyone who broke it. 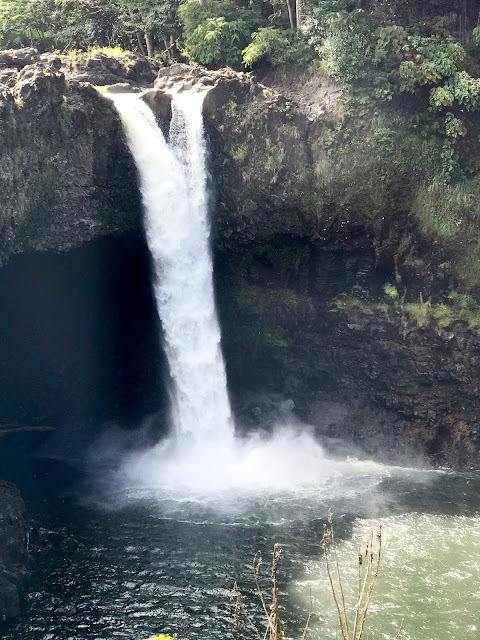 Unless lawbreaker could escape on foot, swim to a place of refuge, cross the sharp volcanic rocks and reach land, he or she could be absolved by a priest. Snorkel boats surround the monument to Capt. James Cook's landing. Photo © Judy Wells. By sea, everyone looks for whales, sea turtles and spinner dolphins. 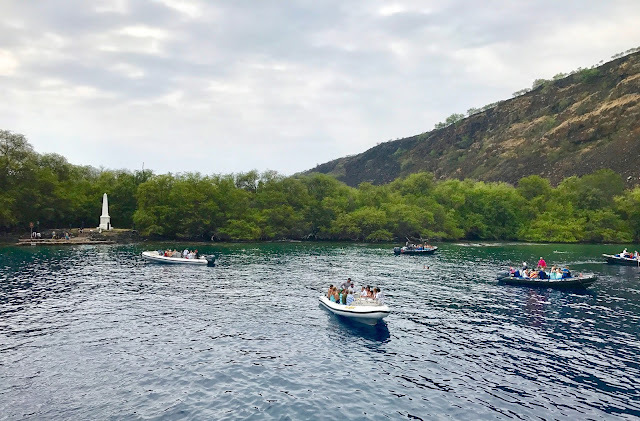 Along the way, tour boats head to Lealakekua Bay. It's easy to spot thanks to a white pillar, memorial to Captain Cook's landing place. Snorkelers head here, too, as this marine reserve is the best place to commune with fish. So good that Disney researchers came here for the film Finding Nemo. 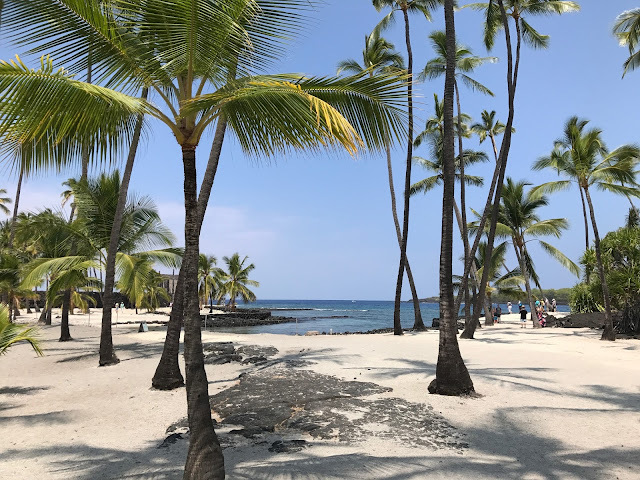 Speaking of fish, those beautiful, golden sand beaches around Kona? Parrotfish poop. Yup. 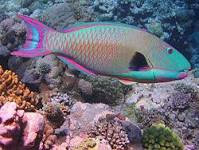 The colorful finned ones eat algae it finds on chunks of coral, grinds it in it teeth, digests it and voila! sand. Isn't travel educational? Madam Pele is watching you. Photo © Judy Wells. Back en route you will pass by Madame Pele's Eyes. 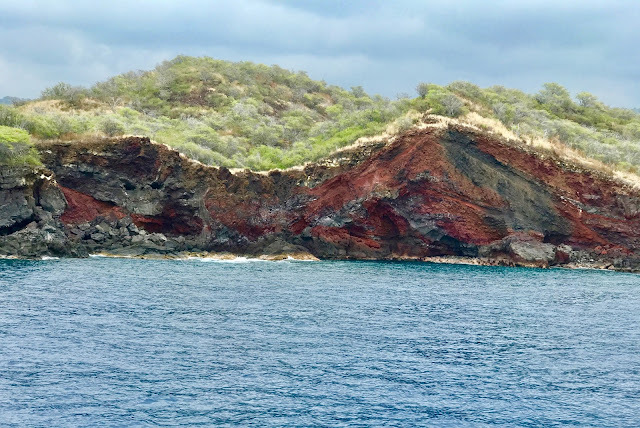 They do seem to be watching the water so that no one removes any of her lava from the island. Those who do are cursed. More than one resident tells of post offices with a pile of souvenir lava rocks that have been mailed back by repentant tourists. Honolulu and Diamond Head. Photo © Judy Wells. No question about that nickname. 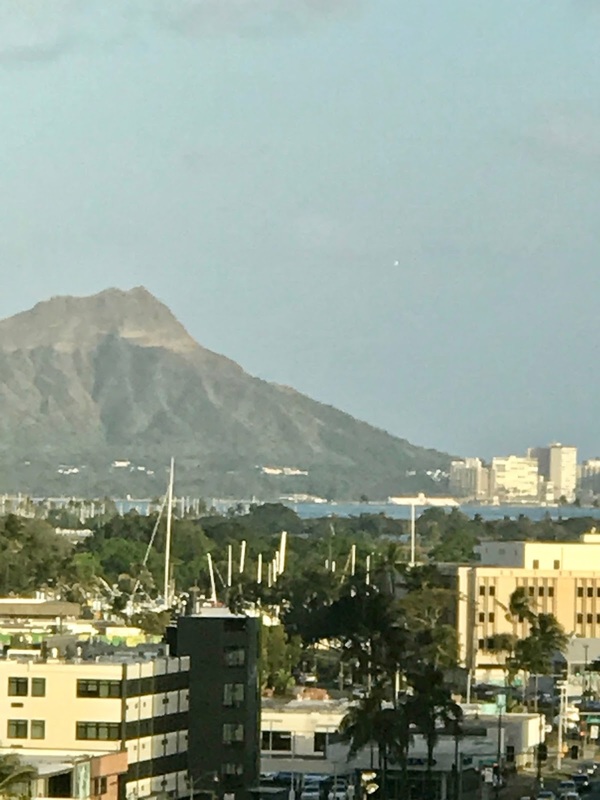 Honolulu comes as a shock. Skyscrapers, wide paved streets, traffic lights, expressways, traffic, lots of people. It is the state capital, the business capital, a city rather than the towns and villages we've been in for the past two weeks. Time is short here. Arrive at 7 a.m., fly out at 7 p.m. A tour of Pearl Harbor and the Arizona Monument followed by a quick city tour will have to suffice. The U.S. Arizona Monument. Photo © Judy Wells. 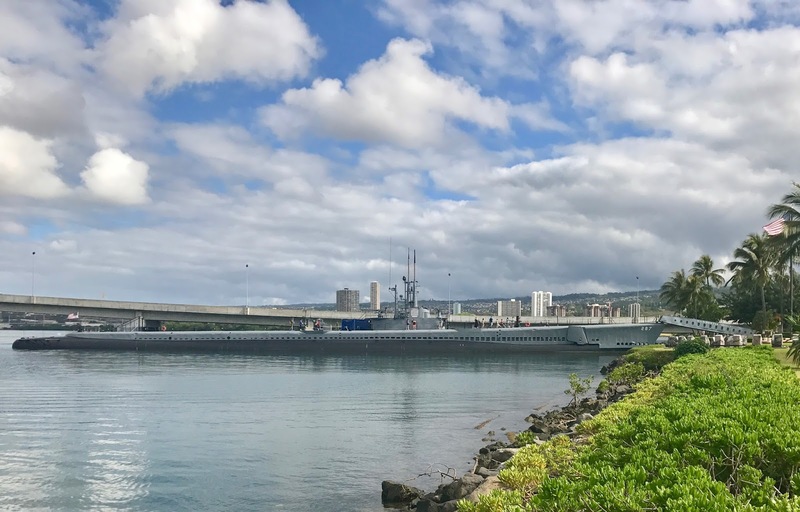 The Pearl Harbor complex is impressive and the itinerary is set. 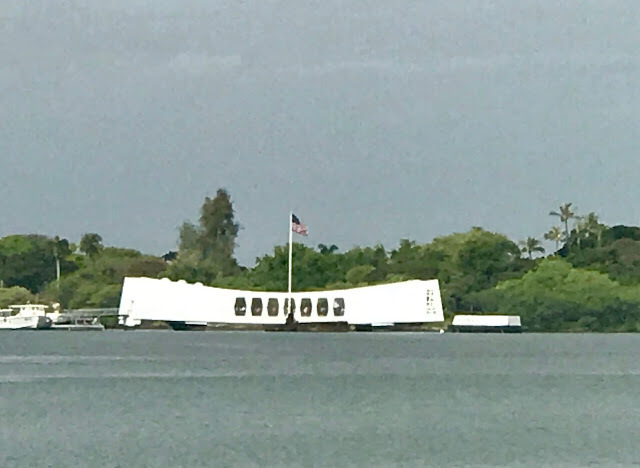 Tickets are timed for entrance to a film on the Japanese attack on the base from which you exit to a boat to the memorial over the sunken Arizona. It is impressive and incredibly moving. Bowfin. Photo © Judy Wells. Before or after, take advantage of the museums, equally compelling thanks to the stories of those who lived through the war there. You can take the submarine tour of the Bowfin, the aviation museum tour or of the U.S. Missouri. read the memorials and listen to the high school bands that play daily. Most of all, pay tribute and give thanks for the men and women who sacrificed their lives. 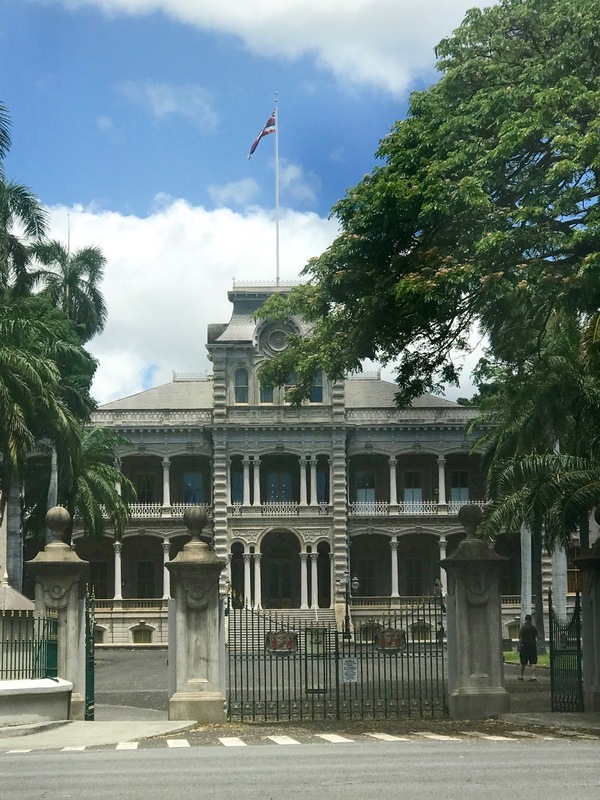 'Iolani Palace. Photo © Judy Wells. 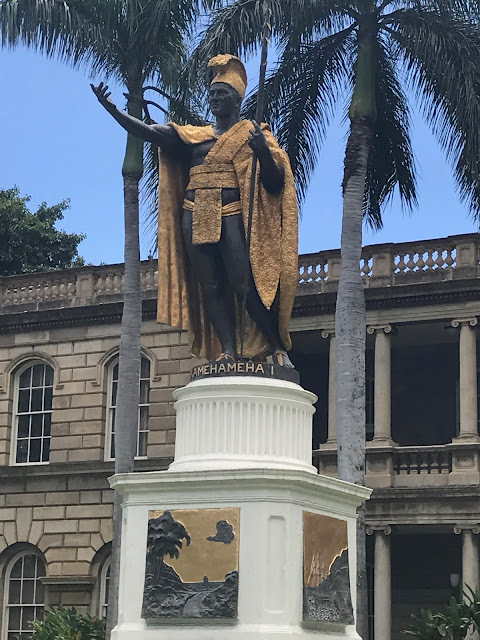 We paused to take pictures of the royal 'Iolani Palace and of King Kamehameha's statue in front of Alioli Hai Judicial Museum . King Kamehameha. Photo © Judy Wells. 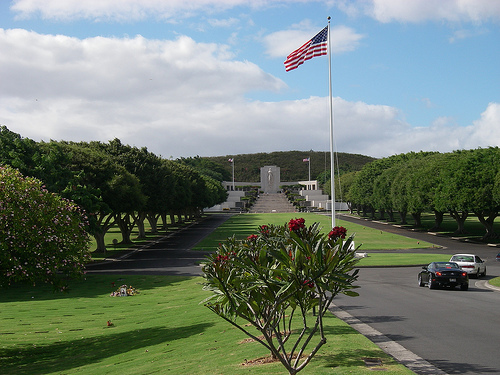 Then it was out for a look at the National Memorial Cemetery of the Pacific in the Punchbowl Crater, high above the city. 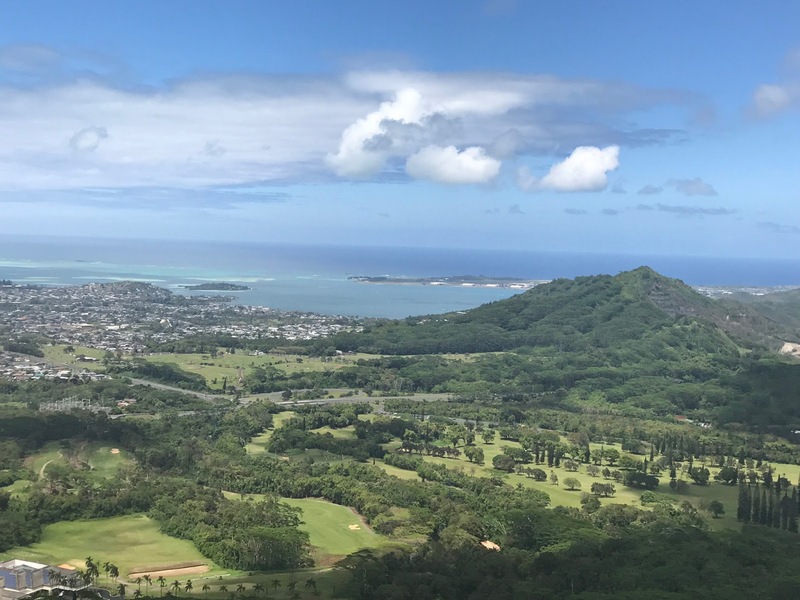 We soon realized that like the rest of Hawai'i the beauty of nature is not far away as the driver took us up to Nuuanu Pali lookout. 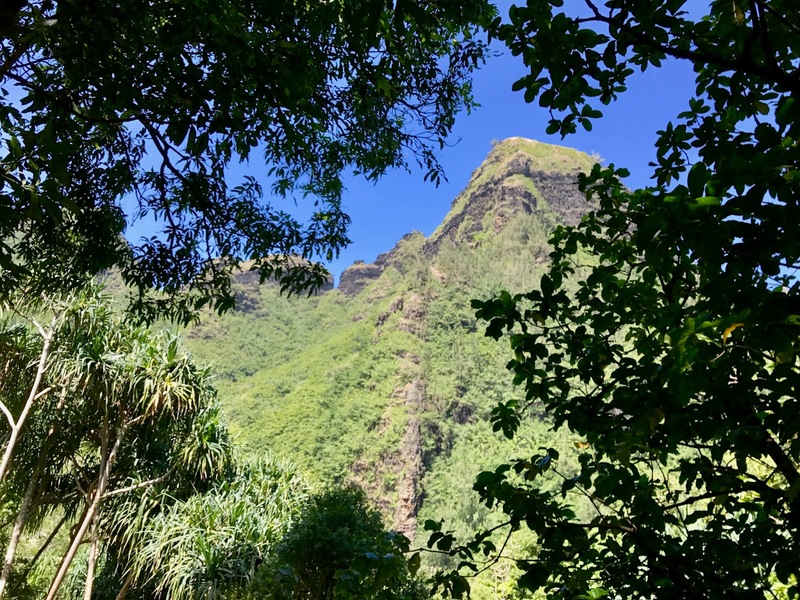 Standing at the railing, gazing out at the Koolau cliffs and lush windward coast left an irresistible desire to return. Windward Coast, O'ahu. Photo © Judy Wells. As we learned on Kauai, Makana,or Bali Hai as South Pacific dubbed it, will call you.